Last month we passed along the story of Aiden, a mixed breed one-year-old found in the woods of southern Georgia. Aidan was starving, he was suffering from heartworm and skin disease, and he had open wounds that appeared to be a result of intentional abuse. Aiden, with his new family! Things have changed for Aidan. 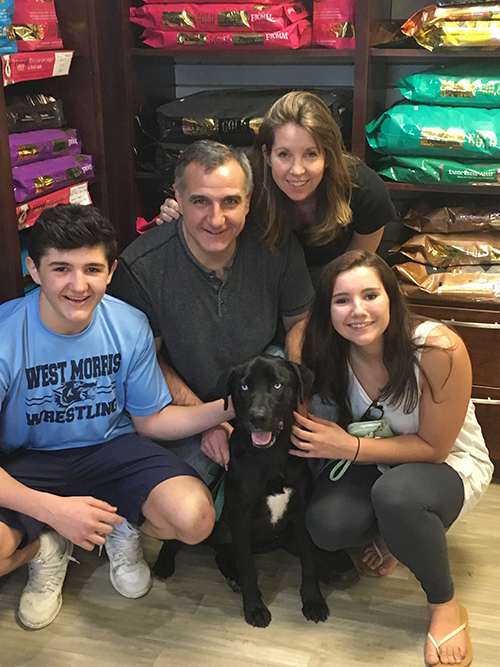 As you can see in the photo, he is a happy, healthy dog in his new home in New Jersey with a loving family. The Tess McIntyre Foundation is proud to have played a small part in assuring Aidan’s happy ending by donating to Home for Good Dog Rescue and sponsoring this brave guy on his journey. We’re also thankful for everyone who played a part in that journey. It began with the Friends of Screven County Animals in Sylvania, Ga., who initially found Aidan. The staff at Home for Goods facility in Aiken, S.C., made sure he got the treatment he needed, nursed him back to health and socialized him with other dogs at the facility. There was the volunteer pilot who flew Aidan and a group of other homeless dogs to New Jersey and the Home for Good foster family who rolled out the welcome mat for him. Finally, there’s the New Jersey family who gave Aiden the home he deserved. The Tess McIntyre Foundation raises funds to help rescued dogs. Working with reputable dog rescue services like Home for Good, we focus on aiding homeless dogs who need medical attention before they can be adopted. One hundred percent of your donations to the foundation goes toward helping these animals as we absorb all administrative costs ourselves.